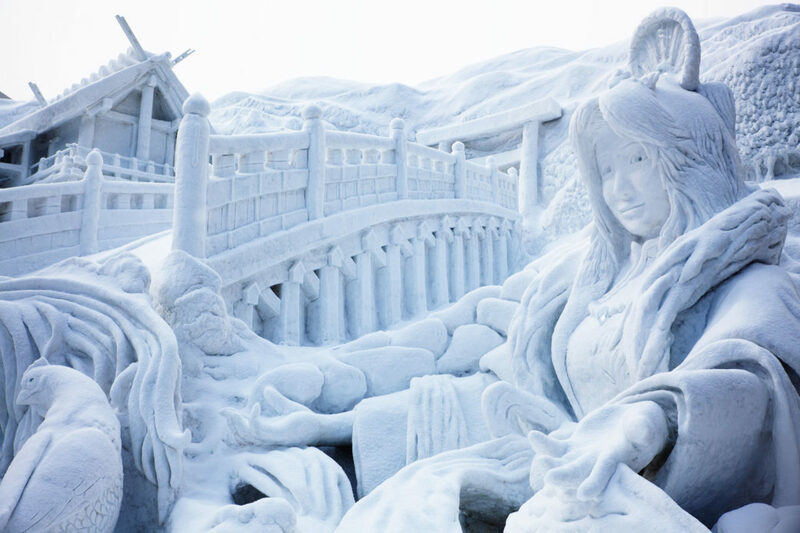 Most famous of Japan’s snow festivals, or yuki matsuri, the Sapporo Snow Festival transforms Hokkaido’s capital into a wonderland of ice and snow sculpture. The festival draws millions of visitors to Sapporo for seven days each February, and international teams compete to create the gigantic and elaborate sculptures, whose themes range from famous landmarks to mythical creatures. The Sapporo Snow Festival is held at three main sites throughout the city, with snow sculptures, mazes, and slides at the Sapporo Satoland, ice carvings amidst the bright lights of Susukino, and Odori Park featuring snow sculptures of various sizes. Held as it is in February, the Sapporo Snow Festival falls at the peak of Hokkaido’s winter and combines beautifully with a visit to Hokkaido’s mountains for some of Japan’s best skiing or snowboarding. Into Japan Specialist Tours would be delighted to include the Sapporo Snow Festival in your tailor made winter holiday to Japan.